An Interstate 295 trailblazer for the connector from Pennyfield and Lawton Avenues to Prentiss Avenue in the Throgs Neck neighborhood of Bronx, New York. Photo taken 08/29/05. Interstate 295 is the combination of the Clearview Expressway, Throgs Neck Bridge, and Cross Bronx Expressway Extension in New York City. It is a freeway open to all traffic (unlike the parkway system). Interstate 295 begins at Grand Central Parkway near Hollis in Queens and travels north across the tolled Throgs Neck Bridge to Bronx. The freeway culminates at the Bruckner Interchange, where I-95 (Cross Bronx Expressway), I-278 (Bruckner Expressway), I-678 (Whitestone Expressway) and the Hutchinson River Parkway come together. Originally, the section of Interstate 295 was planned as part of Interstate 78 through New York City. However, when several sections of Interstate 78 through Manhattan and Brooklyn were canceled (including the Lower Manhattan Expressway, Bushwick Expressway, and the southern half of the Clearview Expressway), the completed section of the Clearview Expressway section was renumbered as Interstate 295. The southern extension of the Clearview Expressway, north from the Nassau Expressway / Belt Parkway to Grand Central Parkway, was not constructed due to community opposition and other considerations. I-295 ends just south of high speed ramps with Grand Central Parkway at a traffic signal with New York 25 (Hillside Avenue) in the Queens neighborhood of Hollis. Approaching Interstate 295 (Clearview Expressway) on Grand Central Parkway eastbound. Vidcap taken 09/93. Beyond the Randall Avenue off-ramp, the final exit on northbound Interstate 295 (Cross Bronx Expressway Extension) is the Bruckner Interchange. Connections are afforded to Interstate 95 and the continuation of the Cross Bronx Expressway of west and Interstate 278 (Bruckner Expressway) south. Photo taken 08/29/05. Interstate 295 north defaults onto I-95 (Cross Bronx Expressway) south at the Bruckner Interchange. Two lanes join the Bruckner Expressway west to the RFK (Triboro Bridge) to Wards Island and Manhattan. Photo taken 08/29/05. Interstate 295 ends as the Cross Bronx Expressway extends west along Interstate 95 to the Alexander Hamilton Bridge over the Harlem River and the George Washington Bridge to New Jersey. Photo taken 08/29/05. These button copy signs at the Castle Hills Avenue off-ramp referenced the original mileage based exit numbering system for the Cross Bronx Expressway. Photo taken 08/29/05. Sign replacements made for I-95 north at the Bruckner Interchange replaced New England with New Haven, Connecticut. Photo taken 08/29/05. Exit 6B leaves the Cross Bronx Expressway north beyond the Watson Avenue overpass for I-678 south to JFK International Airport. There is no access to the Hutchinson River Parkway, which continues north from I-678. Photo taken 08/29/05. Northbound Interstate 95 (Cross Bronx Expressway) enters the early 2000s-reconstructed Bruckner Interchange. Interstate 678 extends the Hutchison River Parkway south as a full freeway to the tolled Bronx-Whitestone Bridge. Photo taken 08/29/05. Interstate 95 north elevates over I-678 and the Hutchinson River Parkway with three lanes to the partition with I-295 at Exit 6B. Photo taken 08/29/05. Interstate 95 north splits with the Cross Bronx Expressway Extension at Exit 12 and Interstate 295, while overtaking the Bruckner Expressway east from the ending I-278. Photo taken 08/29/05. Interstate 295 heads southeast two miles to combine with I-695 (Throgs Neck Expressway) ahead of the toll plaza for the Throgs Neck Bridge to Queens. Photo taken 08/29/05. A distributor roadway takes motorists from the east end of Interstate 278 (Bruckner Expressway) to both I-678 (Hutchinson River Expressway) and I-295 (Cross Bronx Expressway Extension) south to Queens. Photo taken 08/09/04. Traffic from I-278 partitions with a two-lane ramp departing for I-678 and the Whitestone Bridge south to Flushing, Key Gardens and JFK International Airport. Interstate 295 south begins with four through lanes. Photo taken 08/09/04. A lane drop occurs at the Union Turnpike off-ramp (Exit 2), with Interstate 295 advancing south with two lanes to Grand Central Parkway (GCP) and Hillside Avenue. Photo taken 06/13/05. One quarter mile ahead of the four-level interchange (Exit 1) with Grand Central Parkway on Interstate 295 south. The exchange is located less than two miles west of the Belt Parkway. Photo taken 06/13/05. Exit 1 leaves Interstate 295 south for Grand Central Parkway, one half mile from the Clearview Expressway end at New York 25 (Hillside Avenue). Photo taken by David Greenberger (03/01). Interstate 295 passes below the four level interchange with Grand Central Parkway on the quarter mile leading south to New York 25 (Hillside Avenue). Photo taken 06/13/05. The high speed exchange with Grand Central Parkway remains from the unconstructed extension of the Clearview Expressway south through Bellaire and Cambria Heights as part of Interstate 78. Photo taken 06/13/05. 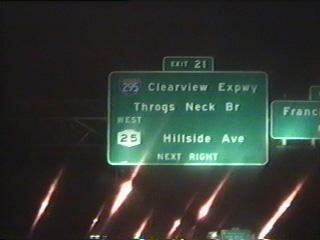 The Clearview Expressway ends at a signalized intersection with NY 25 (Hillside Avenue) and Hollis Court Boulevard south. NY 25 parallels Grand Central Parkway west to Jamaica Estates. The state route turns onto Braddock Avenue to the east en route to Jamaica Avenue and Floral Park. Photo taken 06/13/05. Button copy overheads formerly posted at the Grand Central Parkway westbound ramp separation for the Clearview Expressway at Exit 21. Photo taken by Douglas Kerr (07/00). 212th Street heads north from Jamaica Avenue through the Hollis community to intersect NY 25 (Hillside Avenue) across from the Clearview Expressway beginning. Photo taken 06/13/05. 212th Street north at NY 25 (Hillside Avenue). Interstate 295 starts one block north at Whitehall Terrace. Photo taken 06/13/05. Interstate 295 (Clearview Expressway) shifts to the left to navigate through the four-level exchange with Grand Central Parkway as Exit 1 separates to the right at Whitehall Terrace. Photo taken 06/13/05. New York 25 (Hillside Avenue) east at 212th Street north to I-295 (Clearview Expressway) and adjacent Grand Central Parkway. Photo taken 06/13/05.